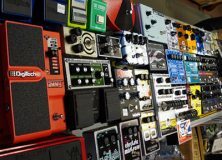 Last time, we talked about the power supply requirements for your pedal board. 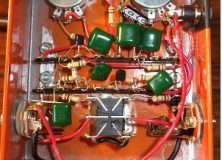 In the future, I’m going to show you how to make a be-all-end-all rechargeable power supply for your board that eliminates all the problems associated with plugged in supplies. Here we’re going to toss around another confusing topic, true bypass or buffering. Lesson Six – What’s the deal about bypass or buffered? This is a highly controversial topic. It’s also a little technical, so bear with me here. I am going to assume (never a good thing) that you have a basic idea of what capacitance is. If you don’t, there are plenty of places online to get good info. Just search it. One of the definitions is the property of an object to hold a charge. You must also have some knowledge of physics. Let’s consider a guitar cable, for round numbers, let’s make it 20 feet long. It has an inner conductor, where the signal travels, and an outer shield attached to the signal ground. Now, these two “conductors” aren’t connected together but, because they are in close proximity to each other, a signal in one (the center core) will induce a charge between the two because of the laws of physics. (No. I’m not going there. Remember, it’s all FM.) This charge that builds between these two “conductors” in your cord is exactly what a capacitor does. In reality, your guitar cord is a capacitor and, since the outer shield is grounded, some of your signal strength is being eroded and sent to ground, thus decreasing your signal level at the end of your cord (the amp). Now, if you add up all the cords involved in connecting your guitar to your amp, through your pedal board, you may have quite a long cord in actuality. The longer the chord, the more “capacitance” you have. The more capacitance, the more degradation of your signal occurs – mainly in the high frequency range. You’ll be cranking up the volume and treble on your amp to compensate. That’s obviously not going to work for the average guy. The fix is to use a buffer… or is it? 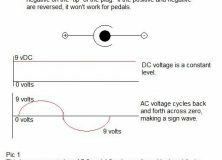 A buffer takes the high impedance signal from your guitar (unless you have active pickups) and drops it to a low impedance signal, which is much less affected by capacitance. But, some types of pedals don’t function well when there is a buffer in front of them. Many fuzzes, for example, use the guitar’s pickups and volume knob as a part of their circuitry (the germanium Fuzz Face comes to mind here) and the buffer will remove this ability so the fuzz just doesn’t work well. This gets complicated, huh? Then, there are the wahs. A wah wants to be in front of a fuzz, but needs a buffer behind it to truly function well. My Crybaby is a noisy mess without buffering. But, with the buffer in the circuit, the fuzz is terrible. What’s the solution? You need to have multiple signal routes through your pedal board in order to make your signal optimum. Kind’a makes you want to chuck the whole mess and just simplify your setup. Look up the Stratkat Switcheroo here on G-M. 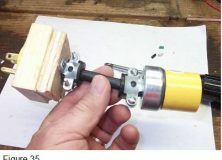 This simple addition, or a couple of them if need be, will solve lots of buffer/bypass dilemmas. You could also use a commercial unit if you have plenty of cash. You will need one with buffering capabilities that you can switch in and out. Only you can determine if your setup works for you and the only way you can be sure of that is to employ the old trial and error method. There are no rules! There are suggestions and I’ll go through them coming up. Generally speaking, effects loops are designed to work with rack mounted effects units, not pedals. In my case, my amp has a “pre out” and “power in” stereo jack which I have an adapter for that I use to run my pedal board in an “effects loop.” The result of doing this is enormously different than plugging my board into the front of the amp. Mainly, this is because the amp is expecting certain levels here and, if it sees something else, it gets flustered and goes off the deep end. Many amps that have an actual effects loop, are buffered to drop the impedance of the loop and help fight the noise problem inherent in loops. Everything you enter into the loop will be amplified, usually, with no ability to control the noise that might be added by cabling, ground loops or just plain noisy pedals. The built-in buffering helps to minimize this problem, although, some pedals may not perform optimally when put into this situation. 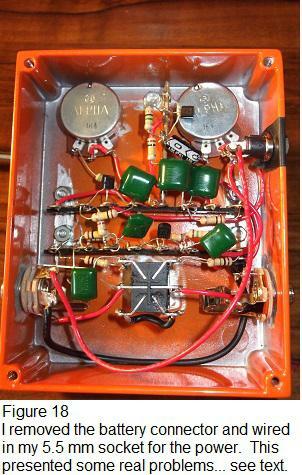 Pedals are mostly designed to plug into the front end of your amp, not the middle. If you’re lucky, or knowledgeable, enough to have an amp with level controls on your send and return, you can tune the levels right at least. Score one for you! Here’s where this gets a little interesting. If you use amp generated distortion, you will probably want it in front of any modulation effects, delay, for example. In that case, place the delay in the amp’s effects loop so the effects order is correct, or, rather, what you want. You could add any modulation effects in the effects loop, run your wah and distortion into the front end, and have, maybe, the best of both worlds. You’ll have to be the judge. In my case, I would have to run the preamp out to my board, through my effects, then back to the power amp in, hoping I won’t pick up Radio Free Europe with the giant antenna I just ran across the floor. (You greybeards will know what RFE is… you young guys, not so much.) All you can do is give it a shot and see if it works for you. Next time… The dreaded order for your pedals. This is a great article. I have used fx loops with hit or miss success in the past. I got the new orange micro dark, which is an incredible sounding amp at about the cost of a good pedal. I have been trying my fx with it, and had a couple of modulation pedals that sounded like **** through the front end. I was almost certain it was the pedals, and was planning on starting to replace components, etc. Anyway, this reminded me to try the loop, which is buffered, and the pedals function properly through it, the loop is great!